Housekeeping is a time-consuming task. Long lists of chores that never seem to get done, hours spent scrubbing every corner of your home. Wouldn’t you rather spend your free time doing the things you love? We have the solution. Helpling is the easy way to book housekeeping services in Singapore. Booking takes just 60 seconds through our website. Simply tell us a bit about your home, when you want your cleaning, and pay securely online. That’s all it takes. We’ll then match you with an insured, background-checked, local cleaner who can come and take those dreaded chores off your hands. Leaving you with more free time and a home that sparkles from top to bottom. Our cleaning service rates are transparent and competitive, whether you want a regular housekeeping service, a one-off clean, or even a spring cleaning service. Read more about our prices, our cleaners and our customers below. You can also find out more about how we select our cleaning partners and the additional services we offer. Our cleaning services prices are transparent and simple. Our hourly rates are fixed, and include absolutely everything – no maid tipping required. Payment is all taken care of online through our secure website, so there’s no need to rush to take out cash before your housekeeper arrives. Regular housekeeping services for your Singapore home (so once a week or once a fortnight) are just $20 per hour. If you’d like a one-off cleaning of your home, our prices are still very competitive at $30 per hour. There are no binding contracts and no hidden fees. Just housekeeping services whenever you need them. To make booking a Singapore housekeeper even easier, you can use our handy time calculator to work out how many hours of cleaning your home will need. You’ll find this in the first step of the booking process. 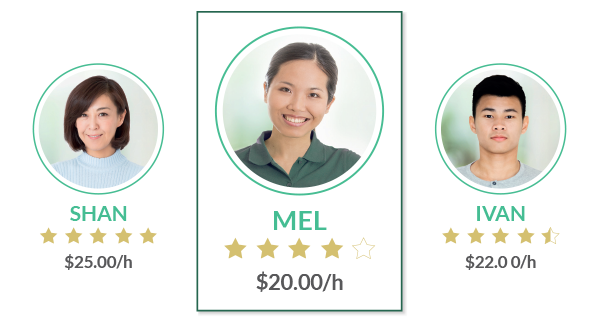 The Singapore housekeepers on the Helpling marketplace are insured, background-checked, and vetted. Thanks to our rigorous selection process, you can be sure that you’re getting some of the best housekeepers in Singapore. Every one of our housekeepers is background checked, and a personal interview is conducted with our Helpling staff. We ensure all of our housekeeping partners meet the high standards that we – and our customers – expect, and value customer satisfaction as much as we do. Each housekeeping job undertaken through Helpling is also backed by our $1 million insurance. So in the very unlikely event that something goes wrong during your cleaning, you can rest assured that your home and belongings are fully covered. We match you with the best housekeeper in your area, based on the location of your Singapore home. If you’re especially pleased with your housekeeping service, you can request the same part-time housekeeper during your next booking, or for your recurring booking. If your regular cleaner isn’t available, we’ll arrange for another of our wonderful partners to come and take care of your home cleaning, subject to your approval. In addition to general housekeeping services, you can also request your part-time housekeeper to take care of additional cleaning tasks. There are corners of our houses that are always forgotten, with chores left on our to-do lists for months at a time. Whether it’s cleaning your fridge, oven, windows, wardrobes, or doing your ironing, no-one wants to spend their free time scrubbing their home from top to bottom. Our housekeeping partners can happily take these chores off your hands, for the same transparent rates as our usual home cleaning. Add one or all of these services to your housekeeping service and come home to a house with every corner fresh and sparkling. Looking for a more thorough deep clean, external window cleaning, or office cleaning service? We can also provide you with professionals who can take care of these specialised tasks for you. Find out more here and get a quote for end-of-tenancy cleaning, post-renovation cleaning, window cleaning, or commercial cleaning.